Telluride History recognizes the Utes as the first nomads to make their summer camp along the river in Telluride’s box canyon and then south to the red rock canyons in the winter. In 1858 gold was discovered near Denver, making the Colorado Territory famous among the prospectors. Although The Civil War temporarily postponed emigration to the San Juans, by 1873 the prospectors were ready to move. In 1874, an explorer came with a U.S.G.S. survey team and eventually the region was mapped, making Telluride more accessible to prospectors. In 1875, a man reportedly packed out $10,000 in gold ore and news of the strike spread. By 1876 the valley floor and surrounding hillsides were teeming with miners and their families. With this, the town of Columbia, Colorado was born in 1878. In 1880 the Postmaster General refused to grant Columbia a post office because of the potential for confusion with Columbia, California. The Postmaster therefore established a post office called “Telluride” (taken from the word tellurium, a nonmetallic element often found in mineral deposits with gold and silver; an element found in “fool’s gold”) which the town took on officially in 1887. In 1890 the Rio Grande Southern Railroad arrived in Telluride opening the way for immigrants and swelling the population to some 5,000 by the turn of the century. Telluride was a thriving metropolis in the mountains. In the summer of 1891, Lucien L. Nunn, in partnership, revolutionized the power industry with the world’s first successful transmission of alternating current (AC) power from his hydroelectric plant in Ames to the Gold King Mine near Alta. The benefits of inexpensive power for local mining and milling operations were immediate. Until the early 1900s, tens of millions of dollars in gold, silver, lead, copper and zinc ore were extracted from the 350 miles of tunnels that ran through the mountain basins east of Telluride. Slowdowns at the mines followed WWI, and with the beginning of the Depression mining in Telluride came to a virtual standstill. By the late 1960s, the population had dwindled to less than 600 residents. In 1963, due to its significant role in the history of the American West, Telluride was recognized through the National Park Service as “nationally significant in American history and culture.” With this, Telluride became a National Historic Landmark District. Only four other Colorado communities share this honor. During the 1970s, several of the town’s forward thinking citizens joined forces with an entrepreneur and the beginning of the Telluride Ski Area was cut out of the north face of Gold Hill’s slope and headed down the south side to town. In 1978, Telluride Ski Corp. planned a ski area expansion that would eventually make Telluride a destination resort. As Telluride became renowned as a popular winter ski destination, summer festivals were born to balance a viable winter and summer economy. Some of the longest-running summer festivals began early in the 1970s with Telluride locals at the helm. 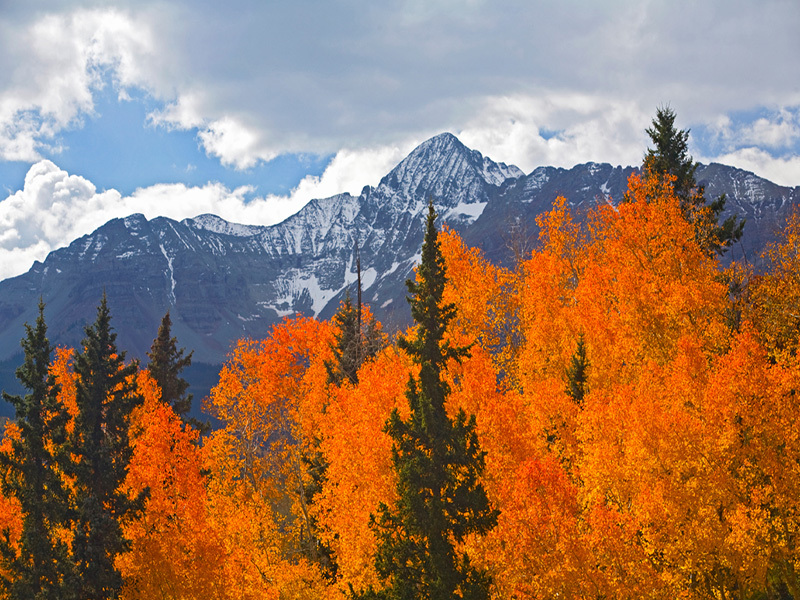 The Telluride Film Festival, Telluride Bluegrass Festival, Telluride Chamber Music and the Imogene Pass Run were the first of what is now a full summer of festival enjoyment. Telluride boasts additional celebrated festivals that include Mountain Film, Jazz Celebration, Telluride Blues & Brews Festival, Wild West Fest, Telluride Balloon Festival, Telluride Wine Festival, Telluride Mushroom Festival, Plein Air, Writers in the Sky, and Telluride Horror Show. Today Telluride’s population fluctuates at 2,200 residents. On the National Register of Historic Places, Telluride Historical Museum was built in 1896 by Dr. H.C. Hall as the miners’ hospital. Located at the north end of Fir Street, it served as an infirmary until 1964 and reopened as a museum in 1966. The collection is three dimensional with staged groupings and hands-on interactive features, including a hospital room, a model that shows how Nunn’s original AC power transmission worked, mining artifacts, and many historic photographs and relics from the region. Summer hours are Tuesday through Saturday, 11:00 am to 5:00 p.m. with extended hours every Thursday until 7:00 p.m.; Sundays 1:00 to 5:00 p.m. Call (970) 728-3344 for more information, or visit www.telluridemuseum.org.